September 28th, 2016 | News and Events, Wheaton World Wide Moving. Direct Lease Driver of the Month, Glenn Gilbert, Albuquerque, N.M., has more than 31 years of experience as a professional household goods mover. He maintains a top driver rating with a near perfect score in customer service. This is Glenn’s first Driver of the Month award with the van line. Rick Senones, Willie’s Transfer & Storage, West Palm Beach, Fla., earned Wheaton’s Permanent Fleet Driver of the Month award. Rick has more than 23 years of experience as a professional mover. This is his tenth Driver of the Month award. Rick also was selected as Driver of the Year in both 1995 and 2013. 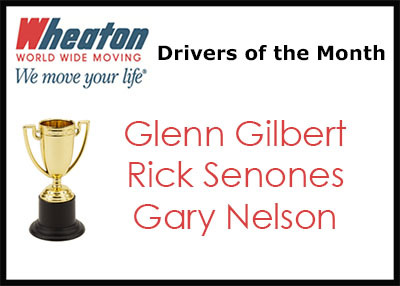 Gary Nelson, Merchants Moving & Storage, Inc., Hamilton, Mont., earned Wheaton’s Intermittent Fleet Driver of the Month award. Gary is part owner of his agency and has a top driver rating. He also has more than eight years of experience as a professional mover. This is his second Driver of the Month award. For their efforts, each driver receives a cash award, plaque, Driver of the Month uniform patches and equipment decals. In addition, all are candidates for Driver of the Year recognition in 2017. Join us in congratulating each on their accomplishment.